What is Retroactive Pay and How to Calculate it? Retroactive pay is the remuneration that an employee should ideally receive for the work he has completed. This Workspirited article tries to explain the importance and meaning of retroactive pay and how to calculate it. Retroactive pay is not available in all jurisdictions. If you feel you are entitled to the same, first, you need to check your state laws, and then hire an employment lawyer who will help you draft your case. An employer is supposed to ensure that his employees are paid exactly what is entitled to them, irrespective of pay hikes or labor negotiations. If an employee has performed the assigned work on schedule but has been paid lesser than what he should have been paid, he is technically entitled to retroactive pay. The definition of retroactive pay specifies that it is the pay from the previous pay period that the employee must receive, for the work that he has done. Not all states, however, support laws related to this payment mode. Through the following paragraphs, you will understand how to calculate retroactive pay so that you can claim for that amount if needed. Let us assume that a particular employee works on an hourly/monthly basis and is paid a stipulated amount. If the employee has done more work in the last pay period than he is being paid for, he can actually claim a retroactive pay. It can be called a delayed payment for work that has been already completed, possibly at a lower pay rate. Normally, employers try to compensate the same by means of a pay hike or a lump sum towards the end. In fact, some employers make the payment in small amounts with every paycheck. Retroactive pay can also occur due to an administrative error, a change of department, or incorrect calculations. The claim for retroactive pay must be made within a specific period, or else the employee may have no right after the period has lapsed. It is the standard rate paid to employees on an hourly basis. This rate normally varies according to the employer's discretion; however, it has to fall within the standard norms. If the employer finds the employee's work more than satisfactory, he may increase the hourly rate. The hourly rate may also increase in case the employee decides to compensate for the employee's extra working hours for paying the retroactive salary. 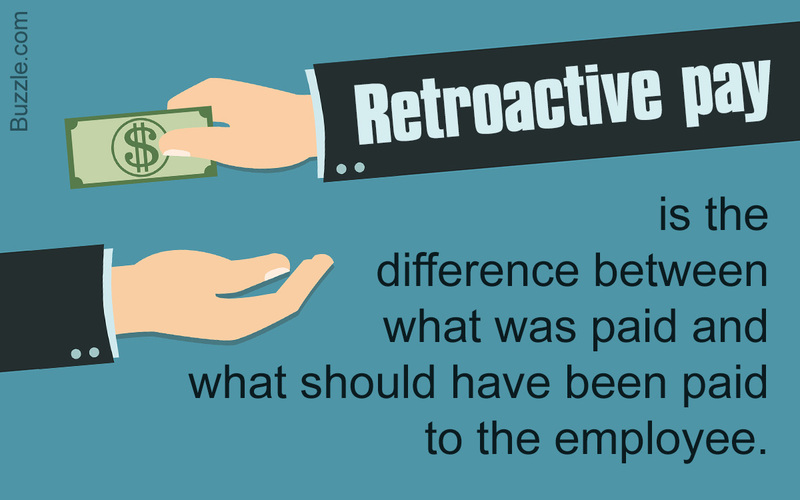 Many people confuse retroactive pay with the term 'back pay'. However, they are both completely different. While retroactive pay refers to the pay that has not been given to the employee for the work he has done, back pay refers to the wages that have not been paid at all. If there has been a hike in the pay, the employee is entitled to the pay raise. If he has not received the stipulated amount, the employer must reimburse that amount later. This amount is called retroactive pay raise. It is calculated for the pay periods since the rate of increase was established. This salary can be calculated weekly, bi-weekly, or even annually. Figure out how much the employee actually received and how many hours he put in. He may have put in extra hours, but received pay for a lesser amount of time. Determine the pay per hour (if he/she is being paid per hour). The compensation has to be paid on an hourly rate only. Calculate how much the employee should have been paid, putting in his extra hours. Subtract the amount the employee has received from the amount he should have received. This is the retroactive pay. Let us assume that an employee is supposed to work 40 hours per week at the rate of USD 10 per hour. In this case, he should actually be receiving (40 X 10), i.e., USD 400. Let's say the employee has worked for 45 hours instead, thus, he has worked for 5 extra hours, but hasn't received the entitled pay. While clearing the retroactive pay, the employer needs to first calculate how many extra hours the employee has put in, as well as the hourly rate. In the above case, the employee has worked 45 hours. Therefore, he should ideally be paid USD 450. Thus, retroactive pay = 450 - 400 = 50. The employee has to be paid USD 50. This can be done by means of a pay rise, or the employer could add this amount to the employee's subsequent paycheck. In case of a retroactive pay rise, the employer needs to first figure out the rate of increase, and then, the number of pay periods wherein the employee worked without a pay rise. For instance, if he was being paid USD 10 per hour. Then, assuming that he works for 40 hours a week, his salary for four weeks would be (40 X 4 X 10) = USD 1,600. However, if there has been a pay increase of USD 5 over the last two weeks, then the salary for the last two pay periods will increase accordingly. If he was being paid according to the rate of increase, he should have been paid (40 X 2 X 15) = USD 1,200 only for the last two weeks. Thus, his total salary for four weeks would have been 1,200 + (1,600/2) = USD 2,000. Thus, his retroactive pay will be (2,000 - 1,600) = USD 400. Mostly, employers are not supposed to have a retroactive pay cut, if they do, the employee is supposed to be informed beforehand. Employers may establish a retroactive pay increase to retain good employees. Retroactive pay is subject to taxes, it is reported as a part of their total annual wages. If you decide to file a claim in the court for this amount, the court will first check the employment contracts. If there is anything in the contract that may indicate that you are in the wrong, you will lose the case. Therefore, tread very carefully. Quite often, retroactive pay is given in the form of a single, one-time lump sum payment. Rightfully, retroactive pay should be paid to the employee. However, despite administrative flaws, many states do not legally allow the amount to be paid to the employee. In the states that do, an employee has the right to hire a good lawyer and get back the money he has worked hard for. However, the case has to be built very carefully, and may result in the employee paying taxes on the same amount.